I have never danced before will the classes be too advanced for me? I used to dance when I was younger but haven’t for years. Will the classes be suitable for me? We have lots of members that danced when they were younger and have come back to it as an adult for fun and fitness. We have lots of classes you will love and we look forward to you rediscovering your love for dance with us. For most of our classes you just need to come in something comfy that you can move in. For Zumba, hip hop, RaggaTONE, house, street dance, breaking, Rep-Set-Strong, Clubbercise and Strong you will need clean indoor trainers. For jazz and contemporary you can dance bare foot or in jazz shoes. For ballet we recommend ballet shoes but don’t worry if you don’t have these straight away, socks will be fine! For yoga it’s bare feet. That just leaves waacking where anything goes…trainers or heels…whatever makes you feel fabulous (but you must be in shoes)! Just yourself ready to have lots of fun and we always recommend bringing a bottle of water! We have a few different membership options designed to help you get the results you want. For adults we have options that range from coming to one class each week to unlimited access. For kids classes we offer a monthly payment option. We look forward to discussing this further in person at your free trial class. Is there anywhere I can park at your venues? None of our venues have on site parking but there are local car parks. Check the residential streets locally too as most of them are free to park in the evening and sometimes weekends as well. If you are taking class at one of our two Richmond studios we normally recommend Old Deer Car Park off the A316. Both Richmond studios are very close to Richmond train station, so if you can we recommend getting the train or bus. We have a real mix of people that attend our classes so the average age in classes can vary from week to week. The majority of our adult members are between 20 and 40 with some on either side of that. For children we offer classes from 3 years to 15 years. I have kids that are full of energy, do you have anything for them? We offer classes in street dance styles, breaking, contemporary dance and acro dance classes for kids and teens and we can definitely help with using up some of that energy! If they are aged between 3 and 15 we definitely have something they will love and their first class at the studio is absolutely free. Contact to book a free taster today. We do indeed. Whatever style you are looking for and whatever your current level we can find an instructor to help you get the results you want. Whether you want to learn new skills, improve your confidence, exam coaching, audition preparation or bespoke choreography we are happy to work on a package to suit you. We can offer anything from a one off class to weekly lessons. Please contact us for prices and availability. Can I have my kids birthday party with you? We would love to host your child’s party! We will work with you to create a bespoke and memorable birthday party in whatever style you require whilst saving you time, money and effort. Popular party themes include Street Dance and Pop Princess parties as well as parties themed around a certain band or singer. We offer a free party consultation to discuss your needs and how we can help make your child’s birthday party one to remember! How about a hen party? Yes…we can create a bespoke dance themed hen party for you too. Give us a call on 02034174070 to get some more information or make a booking. Do you have many men that take your adult classes? We do tend to have more female members, however we have some male members and would LOVE some more. Go on give us a call and get your free class booked in! Can I try a class before I commit to anything? Absolutely. We offer you your first class at Studio K absolutely free. Give us a call on 02034174070 to get yours booked in now. Do you hire out your studios? Yes we do! Our bright, spacious studios are perfect to hire for dance rehearsals, casting sessions, acting coaching, yoga, pilates and one to one lessons. The first studio is located right next to Richmond train station and the other lest a minute away from Richmond train station. Both studios have wifi available. The studio above the train station has a separate shower and changing room and the Sun Alley studio offers a separate kitchen and changing room. Please contact us for costs and availability. I have been to dance studios before and found them intimidating, will I find that with your studio? We strive to always offer a welcoming, friendly and non judgemental atmosphere in all of our classes. We believe everyone should be given the same opportunity to have fun, dance and learn new skills in a relaxed and encouraging environment. Can I take any exams with you? Once each year we offer the opportunity for some of our kid’s and teen members to take UDO Street Dance exams. We have also run adult RAD Ballet syllabus classes in the past which if we have enough interest we may offer again in the future. Let us know if you are keen. Do you offer wedding first dance lessons? Need a bit of help with your first dance? Then you have come to the right place! Whether you just want to learn a few basic steps to avoid awkward shuffling around the dance floor and standing on each others toes or would like a choreographed routine…we can help! You can have any number of lessons from just a 1 hour session to weekly/monthly lessons leading up to the big day. (For a fully choreographed routine we normally recommend 5 lessons). Do your classes run all year round? Apart from Easter weekend and Christmas we are open all year for our adult classes. Our kids and teen classes run during term time only. We also offer holiday camps for kids to keep them busy while they are not at school. Can I try a class at any of your venues? Yes. You can come along to any of our classes at any of our locations, just let us know what works best for you. How long do your classes last for? All of our adult classes are an hour long. Our kids classes vary from 30 mins to an hour depending on the age group. Are there any opportunities to perform? Yes! We have lots of performance opportunities including a big full studio show once every two years. We also have both kids and adults performance groups that perform and compete all year round. Contact the studio for more information. Adults are welcome to wear whatever they want/feel comfortable in, however for Ballet we recommend something tight fitting so we can correct alignment. For kids classes we ask that a Studio K branded T shirt or vest top (in red, white or black) is worn for all classes along with leggings, jogging bottoms or sports shorts (no jeans or restrictive clothing) and clean trainers for street dance, breaking and mini/lil groovers. For Contemporary we ask that girls wear either plain black leggings or black footless tights and a black leotard or black footless catsuit with a Studio K T-shirt or vest to be worn over the top. We ask that boys wear either plain black jog pants or plain black dance shorts. Do you offer Pole Dance classes? Yes we do, at the moment these run in 5 week blocks and we offer courses for beginners, Improvers and Intermediate levels. Over each 5 week course you will learn moves, techniques and tricks and will get the opportunity to experience training on both static and spinning pole. All of our Pole Dance courses are open to both members and non members…always fancied giving it a go? Then get in touch and come along! Warning…you might love it and get totally hooked! Just Click on The Button Below To Claim Your FREE Taster Class! 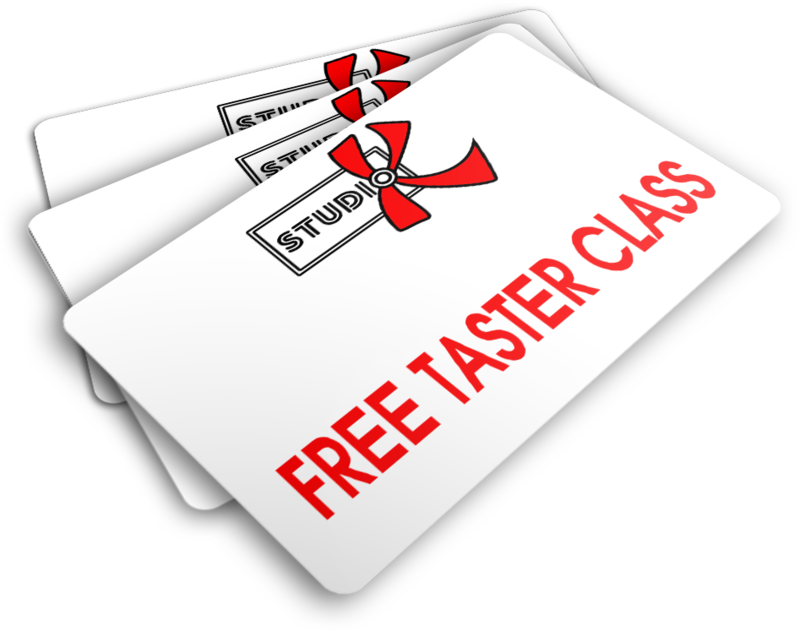 CLAIM YOUR FREE TASTER CLASS!